One of the key performance parameters for many types of occupational, safety and other outdoor footwear products is water resistance. Not only is the ability of footwear to keep out water important, but it is also advantageous to understand the detrimental effects of long term exposure to water. There are a range of material tests that subject samples to conditions likely to encourage water ingress, including flexing and stretching. Likewise, there are whole shoe tests that take a finished product and subject it to forces and factors likely to cause it to leak. These range from a 10-minute test on a centrifuge machine, where a boot is placed in a tank of water which is then pressurised through centrifugal motion, to immersion tests that last for a day or longer. One of the most widely used and industry-respected water-resistance tests is SATRA TM 230: 2014 (adopted as part of the EN ISO 20344 series of European Safety Footwear standards). This test places the footwear onto a foot form, which is then lowered into a tank of water. The depth of water can be varied according to the style of footwear and its likely application, from just above the level of the sole to just under the collar. The foot form is then flexed by means of a pneumatic mechanism, which supplies a constant force to the moving elements of the foot, at a realistic walking rate of 60 flexes a minute. The test can be left to run for hundreds of thousands of flexes, representing a lengthy walk in extreme conditions, during which the footwear is inspected periodically for evidence of leaks. This testing provides a realistic and lifelike assessment of the footwear’s water resistance properties, and very quickly highlights any potential failings in a product’s design or manufacture without recourse to field trials. Field trials can be lengthy, harder to co-ordinate due to the need for suitable subjects and more subjective than mechanised tests. A number of manufacturers of ‘performance’ footwear including outdoor, occupational and military applications are interested in better understanding how durable their products are when subjected to more extreme, but realistic environmental conditions, as might be found at construction sites, farms and quarries, in the countryside and at other locations where footwear is likely to be used in wet, dusty, dirty and gritty conditions. Therefore, a far more aggressive test has been developed to test products under these conditions. When assessing footwear for water resistance, conventional laboratory tests tend to be carried out only in clean water. Specifying the use of distilled or de-ionised water for water resistance testing allows for control and repeatability, and conformity between different laboratories. Use of water of this nature, however, is not really representative of some of the harsh and unpleasant conditions likely to be encountered when wearing outdoor and occupational footwear on construction sites and elsewhere. To address this issue, a new test has been introduced; SATRA TM 446:2015 Resistance to waterborne abrasive materials. This test introduces a key element - waterborne abrasive grit, in the form of aluminium oxide powder. This powder is one commonly used in industry and metal-finishing as an aggressive abrasive powder, and is also used in some SATRA, British Standard and European Standards test methods for assessing a material’s resistance to abrasion. Aluminium oxide grit is an extremely hard, fine powder that provides considerable abrasive power as well as permeation into small gaps in materials or products. With a Mohs’ Hardness of 9, aluminium oxide has a similar hardness to that of diamond and so remains sharp while other materials are ground into a rounded form. The particle size used is in the order of 50µm (0.05mm) and so is fine enough to be able to penetrate many types of material or footwear constructions. Aluminium oxide powder is rated as 240 on the grit scale, making it comparable to the effect of very fine sandpaper. Rather than simply settling to the bottom of the water tank, the grit is kept in circulation by a vigorous bubbling action generated through a supply of compressed air, diffused through a set of specially designed baffles at the base of the tank. These baffles capture settled grit in equally spaced inverted-pyramid cavities, and then re-distribute it by means of a focused stream of compressed air, which is introduced through a small hole at the base of each cavity. This creates a vigorous bubbling body of water that keeps the grit moving and causes it to abrade against the outer surface of the footwear immersed in it. The use of the baffle bed mimics the way in which grit and mud are kept in motion when walking or running through the water. It also imitates moving water itself, such as a running stream or waves. The presence of the abrasive powder in the water greatly accelerates any flexing-related wear and tear. The aluminium oxide grit rapidly works its way into the test sample and becomes trapped between layers or between components that are rubbing together. The aluminium grit may also become lodged between the lining of the boot and the foot form inside it, causing an effect similar to introducing sandpaper between two moving surfaces. In order to accommodate the air diffusion equipment and to make sure that there is a sufficient depth of water to carry the abrasive aluminium oxide grit to all parts of the footwear, deeper water tanks are used. This ensures that gritty water reaches most of the footwear during the test and also creates a far more challenging environment for water resistance testing. Unlike other water resistance tests, what is quantified by this testing is not the ability of footwear to keep out water, rather it is the ability of footwear to withstand the degrading effects of exposure to flexing in dirty water. It is not a leak-resistance test. In fact, most footwear will leak as soon as it is lowered into the deep water tanks, as water will pour into the top of the shoe or over the top of the bellows. This subjection to deep immersion represents some of the harsh environments liable to be encountered by many types of safety, occupational, hiking or military footwear, far better than conventional tests where the water level is often only a few millimetres above the sole or featherline. The key performance criteria related to this test are continued fitness for purpose (do the footwear and its components still function correctly) and whether a piece of footwear retains a presentable appearance after severe use. Photographs taken before and after testing show the damage caused by the abrasive flexing, and are compared to images of an untested piece. Fraying of fabrics, clogging of fastening systems, wearing of mesh panels and discolouration can all be identified through this before-and-after analysis, and may highlight potential flaws in materials or construction. In this way damage to individual footwear components can be identified. For example, in addition to conventional laces, modern footwear can be kept closed by a variety of other, more novel mechanisms – ratchet straps, plastic buckles, and rotary-tensioned wire or cable closures. Each of these mechanisms may have their own weaknesses, and each could be adversely affected by long-term exposure to waterborne particulates. Laces may be abraded to the point of fraying through subjection to swirling waters containing grit, and mechanisms that feature small plastic or metallic components may become jammed with trapped grit. The new test presents an excellent method of assessing the durability of any closing mechanism, and of ensuring that it remains operable after being subjected to tough environments. Although this new test submerges the footwear in water for the duration of the testing, it is not necessarily intended to be of relevance only to footwear designed to be worn in conditions of water immersion. The water is used as a medium for carrying the abrasive particles into all parts of the shoe. 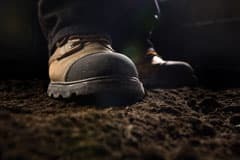 The fit of safety footwear is important not only for the long-term comfort of the wearer, but also for sealing the inside of the boot against the ingress of sand, dust and other contaminants. Safety footwear is commonly laced through D-rings as well as eyelets, and when used correctly this lacing system keeps the footwear snug against the foot. The effectiveness of such footwear at keeping out foreign matter can be assessed by recording the footwear’s mass before and after immersed flex testing (and after rinsing if desired) to establish how much waterborne grit has found its way into the boot. Most of us are familiar with the phenomenon of having grit or a stone in our shoe, and how uncomfortable it can be. When working with sharp sand, cement dust or other similar materials, the presence of even small amounts inside the shoe can be the cause of major discomfort, and possible adverse health effects if left untended. Cement dust, for example, is both irritant and corrosive, especially when wet, and is believed to cause skin sensitisation and dermatitis, so the ability of footwear to seal out irritant material of this nature is most desirable. In addition to mass gain data and a visual assessment (with photographs), the test results can be accompanied by an assessment of how easily the footwear can be cleaned after testing. This can be particularly important for safety footwear worn in the food preparation industry, where wearers may need to clean their boots before and after a shift, or where potentially hazardous materials must be washed off footwear before moving to another area of a site. An additional annex written into the test method allows for the footwear to be weighed and assessed before and immediately after testing, as well as after rinsing with running water at the end of the test period. Ease of cleaning is reflected, therefore, in any change in visual appearance as well as a difference in mass gain figures, due to accumulated silt being washed out of the footwear. Consider the example of simple PVC footwear such as jelly shoes or slip-on plastic clogs. If subjected to this waterborne abrasion test, these may trap some grit, but this grit could be easily rinsed away after the test – in contrast perhaps to a safety boot made with absorbent linings, multiple materials and stitching seams. Test methods are currently in development to assess the drying properties of footwear, and the speed with which footwear loses mass gained during immersion. This immersion involves inverting the boot and then plunging it into a tank of water for five minutes, before leaving it to dry in a conditioned laboratory atmosphere. Boots that may perform well when it comes to keeping water out during testing may often perform badly during this test, as once wet they fail to release water that has been soaked up by linings and fabrics within the structure of the boot. TM 446:2015, Resistance to waterborne abrasive materials, can be used in conjunction with a drying time test to provide a comprehensive picture of the performance of footwear, representing the scenario where a user spends a considerable amount of time walking in deep, dirty water before removing the footwear to dry it out. The amounts of both grit and water trapped within the footwear after such testing can be assessed and used as a measure of the footwear’s ability to be worn, subjected to rigorous use in harsh conditions, and then re-worn – a truly lifelike test. Durability and abrasion resistance are major selling points for safety footwear, especially when purchased for demanding environments. Testing to this new standard provides manufacturers with another method of proving the durability of their footwear under conditions of simulated wear. The European safety footwear standard EN ISO 20344 references a number of different abrasion tests, but these are materials tests confined to one component at a time (lining, midsole or outsole). While component/materials tests are very useful, it is footwear construction, and the way that these materials are utilised in the finished shoe, that makes a big difference to performance. This new test is a whole-shoe abrasion test that takes into account all these factors. There has already been considerable interest in this new test, with footwear manufacturers keen to explore the potential to test their footwear’s resistance to waterborne contaminants other than aluminium oxide. Sharp sand is an obvious candidate for testing safety footwear intended for the construction industry, although research would be required to determine the appropriate levels and constituents for each application. This new method makes available an aggressive but realistic test that should benefit manufacturers of many types of high-performance outdoor footwear.